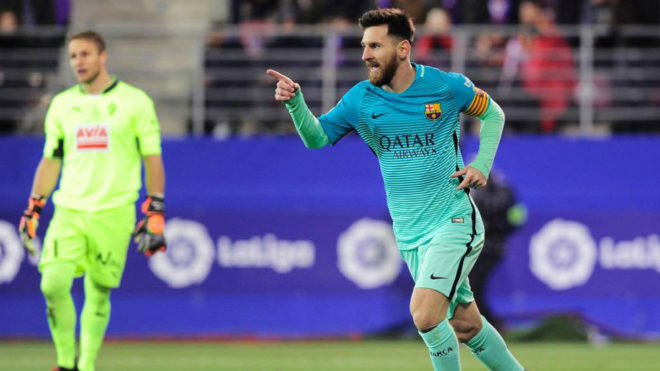 Once again Barcelona have Lionel Messi to thank for taking maximum points in a game, this time a tricky assignment in the Basque Country against plucky Eibar. The Argentinian captain, on a bitterly cold night at the Estadio Ipurua, was at his impudent best and as so often in the past, the Catalan’s opponents had no answer to his wizardry. That said, until Denis Suarez had expertly drilled the visitors into the lead, Eibar were good value and surprisingly had the lion’s share of possession. The centre-back pairing of Samuel Umtiti and Jeremy Mathieu looked uncomfortable at best, but once Messi was in the mood the danger to Barcelona’s back four largely disappeared. Even the injury to Sergio Busquets and Neymar’s under-par showing had little effect on proceedings, so efficient was the No.10 in his work. Where Jose Luis Mendilibar’s side were initially compact and calm, they soon became mere bystanders in his thrall, moribund in all but the basic elements. Team shape became non-existent as these plucky professionals were pulled apart by La Pulga. He had Luis Suarez to thank for a delicious inch-perfect return pass that allowed him to expertly extend his lead in the Pichichi race, and the Uruguayan also deserves a share of the plaudits for a third which was all his own work. But to take the focus away from Messi on this occasion would be to downplay just how influential a performance this was. LaLiga minnows Eibar may be, but it wasn’t too long ago when they held Real Madrid at the Estadio Santiago Bernabeu and in the last eight games before Barcelona strolled into town, they’d lost only two – both to Atletico Madrid. The smallest team ever to make the Spanish top flight are on the rise, improving year on year with a miniscule budget, yet they were undone by a player who’s yearly salary is bigger than their total sporting budget. Other-worldly figures for an exponent who often plays football from another planet. Messi-dependence is a phrase that’s been in vogue for some while now and it’s generally verbalised to belittle the Blaugrana’s efforts elsewhere on the pitch. With performances like this, Luis Enrique and Co. won’t be losing sleep over the perceived criticism.